As most car owners understand, fuel efficiency is important whether its for the environment or simply to save money at the fuel pump. However, you might be unaware of the fact that a fuel injector regulates the amount of fuel an automobile consumes. As the name suggests, a fuel injector discharges gasoline into the car’s engine. Depending on the conditions, the vehicle’s computer (ECU) determines the amount of gas the engine needs by way of the fuel injectors. To avoid issues, these fuel injectors need to be kept clean. Ever since the advent of vehicles heavily reliant on electronics to ensure maximum efficiency, the slightest things can prevent optimal efficiency. This is particularly true when using lower octane fuels that leave valves, pistons, cylinder heads, and the combustion chamber with a gradual increase in gunk, carbon build-up, and varnish. The slightest buildup can wreak havoc on your fuel economy and even cause issues with throttle response, rough idling, knocking, and misfiring. Despite the fact that fuel additives have been commercially available from decades, it wasn’t until recent years that fuel system cleaners (that actually work) began appearing in the market. Through many hours of research, here are our findings for the best fuel injector cleaners. How Often Should A Fuel Injector Cleaner Be Used? Fuel Injector Cleaner Vs. Octane Booster – What’s The Difference? Can a fuel system cleaner cause problems? 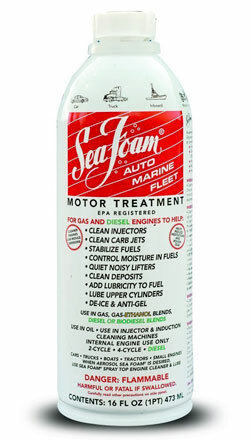 The Sea Foam Motor Treatment is one of the best fuel injector cleaners and engine oil additives (when used correctly) available today. It is engineered for use on gasoline and diesel vehicles and on either 4-stroke or 2-stroke engines. The unique feature of this gas additive is that it uses a 100% natural oil based solvent that acts as a cleaner as well as a lubricant for your automobile’s engine, cylinders, pistons, and carburetors. Sea Foam has huge car enthusiast following and often recommended in various car and truck online forums because it simply works. It essentially re-liquifies sludge and carbon buildup to flush it out of your system. The non-abrasive quality of the ingredients used to manufacture Sea Foam SF-16 makes it equally effective on old, high mileage engines. It’s easy to apply and has separate directions for whether you need to clean your fuel system or add to your crankcase to clean your engine. Sea Foam SF-16 is ideal for ridding heavy build-up and isn’t limited to cars only. You can also treat your lawnmower, boat, tractor, ATV, and others (only if they use regular gasoline or diesel). I personally add some to my lawnmower before the first mow of the Spring. While it may sound like the perfect fuel system cleaner, don’t expect miracles and not everyone will feel a “by the seat of your pants” improvement when driving or a noticeable increase in gas mileage. Still, it’s worth trying at least once. Lucas Oil fuel treatment is made in the USA and consists of a blend of oils and additives designed to clean your fuel system and increase fuel economy. The product is manufactured to work well on both gasoline and diesel engines as well as carbureted and fully injected engines. What makes Lucas LUC10013 one of the best fuel injector cleaner for the money is its value. Whereas the majority of other cleaners will serve a single gas tank, the gallon-size container will treat over 400 gallons of diesel or gasoline fuel. It’s recommended to add 0.32 ounces per gallon but to make it easier, just use 3 ounces for every 10 gallons of fuel. As this cleaner removes away the undesirable residual of the burnt up fuel, Lucas’s formula is also engineered to lubricate the entire fuel operation, which results in improved fuel economy, ride quality, and enhanced engine life. This is an excellent fuel system cleaner for ongoing use since it’s so economical. While not as concentrated as the competition, it appears to work just as well according to most users although it may take 2-3 applications to see the full effect. Because the bottle is so big, you’ll want to dispose of it properly if you no longer have use for it. 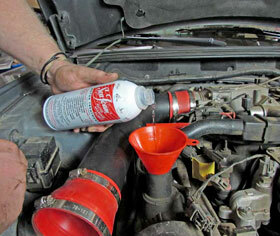 If you need a quick one-time “tuneup” to your fuel system, go with the Sea Foam above. But to keep everything in optimal condition, you can’t beat this Lucal Oil product for ongoing treatment. 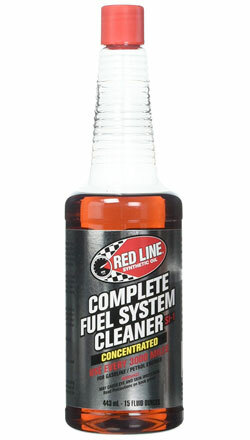 Red Line SI-1 is another excellent fuel injector cleaner that’s quite popular in the automotive scene. It not only cleanses the system but also keeps the build-up of moisture and related substances at bay. Unlike many fuel cleaners that use synthetic oil, Redline uses about 50% verified Polyether Amines to ensure that you have a premium-quality cleaning agent. This cleaner is perfect for gasoline powered vehicles. However, it’s not suitable for diesel engines. Also, SI-1 a feasible option for cars that haven’t been maintained for a while, courtesy of its capacity to remove unwanted moisture, gunk, carbon build-up, rust, and varnish. Moreover, the synthetic mixture of substances minimizes the probability of any abrasive harm to your car’s engine among other parts of the automobile’s fuel system. Red Line is a well-respected name in premium vehicle fluids (motor oil, automatic transmission fluid, power steering fluid, gear oil, and others). They appear to have another winner on their hands. While most users of SI-1 fuel injector cleaner have great results, some say it didn’t do anything in their case and there were even instances of lowered fuel economy. There may be other factors at play there but reviews have been overwhelmingly positive. German-made Liqui Moly is best known for their line of premium motor oils which were originally designed for higher end, German cars. It’s a popular fuel system cleaner for the BMW and Mercedes Benz crowd. That said, you can use Liqui Moly on any vehicle that operates on gasoline. They have a separate fuel injector cleaner for diesels. Liqui Moly fuel injector cleaner is great for high mileage vehicles which have developed a good amount of deposit build-up in their fuel system. 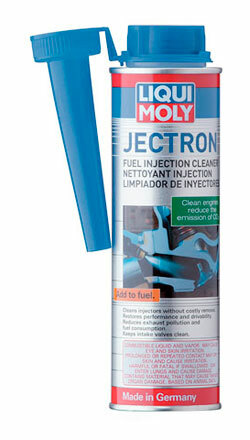 The Jectron in Liqui Moly is the secret to keeping fuel injectors and intake valves clean. 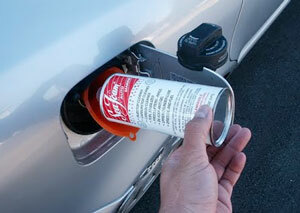 For best results, empty the bottle into your gas tank when it’s about 1/4 to 1/2 full. One application should fix most issues with rough idle, slow throttle response, or hesitation. As with other fuel system additives, you’re going to have a number of users who say Liqui Moly made no difference for them. A lot of them are expecting an increase in fuel economy which they just don’t see. While it won’t do much for everyone (your injectors and valves may already be reasonably clean), it’s definitely worth a shot if you miss the smooth idling or immediate throttle response from when you first got your car or truck. For older vehicles, it’s a good first step before getting out your timing light and messing around with your car’s timing. 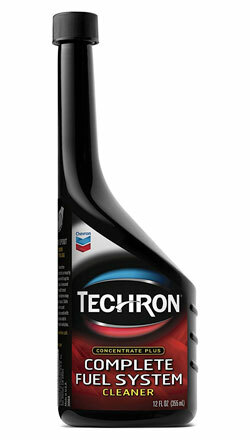 You’ve probably seen a Chevron gas commercial where they mention their use of Techron in their fuel to keep an engine operating at maximum efficiency. This Techron fuel system cleaner is essentially a concentrated version of their additive meant clean and protect the complete fuel system such as carburetors, fuel injectors, combustion chambers, and intake valves in one application. As a result of cleaning up the “gunk”, it restores lost fuel economy, lost power, and mechanics of the fuel gauge sensor. The manufacturer recommends adding a bottle to your gas tank every 3,000 miles but like with other additives, you can extend that to 5,000 miles or even longer depending on you driving habits. Works well with all ethanol fuels (including E85) but you’ll need something else for diesel vehicles. You can even clean dirty spark plugs with this stuff by simply taking them out and letting them soak in a container of the Techron concentrate for a few hours. It’s worth noting that if Chevron is normally where you fill up on gas, you will probably not notice much of a difference since you’re already adding similar additives in your tank with every fill up (at a much lower concentration). Also, while it’s recommended to dump a bottle into your tank when your fuel level is low, you don’t want to do this too often or you risk the possibility of the additive start to eat up various seals in your fuel system. Headquartered in Texas, Royal Purple is another brand known for its premium synthetic oils which drivers swear by. Their 18000 fuel injector cleaner is a highly concentrated, fully synthetic, premium performance fuel injector cleaner that is specially manufactured to fix problems with the modern direct injection engines. However, it can also be used on any kind of fuel injection. The product comprises of highly concentrated polyetheramine detergents that can swiftly clean jammed and choked injectors, whilst reviving 100% of injector flow. The process streamlines injector spray patterns, and atomizes the fuel better as it makes it way to the combustion chamber. The result is enhanced power, improved fuel economy, less emissions, smoother idle, and quicker starts. 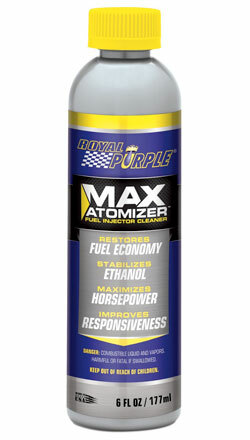 The fact that Royal Purple 18000 is the only fuel injector cleaner that also steadies ethanol – the substance that can chemically breaks down to damage your engine – makes it one of the best fuel injector cleaners out there. While a 6 ounce bottle is enough to treat an entire tank of gas, this additive is more concentrated than others so be sure to use less if you don’t have a full tank of gas or are using with other gas powered vehicles with smaller gas tanks (lawnmower, boat, snowmobile, etc.). The gasoline is burned in your typical combustion engine to generate energy that powers your engine. The gasoline leaves behind solid carbon-based deposits inside your engine that are difficult to remove. However, the chemical called polyetheramine (PEA) is specifically designed to dissolve such deposits and is the fundamental purpose of a fuel injector cleaner. It’s most often advised by manufacturers to use every 3,000 miles. Although most users recommend between 3-5k miles between uses. Once the fuel system issue is resolved, you’re probably fine going with a 2-3 times a year application. 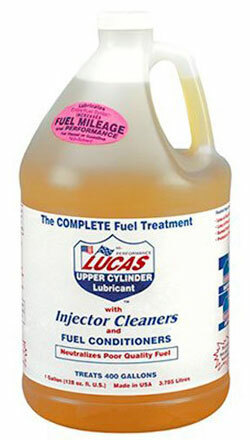 The Lucas Oil product above can be used with every fill up since it’s at a lower concentration of additives. Make sure to read the instructions on the back of each product so you don’t stray too far off the recommended applications. A fuel injector cleaner is exclusively designed to break up the deposits that have developed on your injectors and in other parts of your fuel system, to restore the fuel system to maximum efficiency. On the contrary, an octane booster is designed to raise the fuel’s octane rating. The primary idea behind using boosters is to enhance power and the automobile’s efficiency. Also, an octane booster has anti knock additives, which upon added to fuel, restricts the onset of knocking (pre ignition or detonation). A fuel system cleaner can cause problems when overused without noticing visible signs of stalling, high emissions levels, or poor acceleration. Typically, the additives will start to eat away at the various seals within your fuel system if used too often or too high of a concentrate. Also, you should never use “gasoline-only” fuel system cleaners in diesel vehicles. Always thought these kinds of “additives” were simply snake oil. But my mechanic swears by Sea Foam. I’m giving it a shot on my Mustang which I’ve had garaged all winter. It just doesn’t feel right when I took it out for the first time this week. To be honest, I think there are a lot of “snake oil” type products out there. These cleaners are some of the most reputable out there with an actual track record. Is RXP good to use in your gasoline engine to eliminate carbon build up. RxP Gas Kicker has been around for years and has a pretty good reputation but most people have probably never heard of it. It looks like one of those tiny bottles of 5-Hour Energy. Autozone used to carry it really cheap but not sure if they do anymore. Jones Motor Purr has a Gas and Diesel Injector Cleaner that has been popular for decades. The company was started in southern CA in 1967, and has been around ever since. Honestly, you can use it with every tank of gas until you see the results you want. For best results, you want to add it to an almost empty tank since it’ll be more concentrated and drive around a bit (and/or rev your engine a few times). Add approximately 2 ounces per gallon.